They really do melt in your mouth. I was surprised that so few ingredients made such a tasty little cookie. 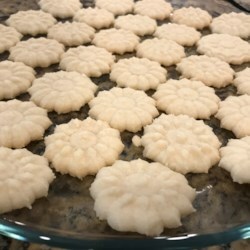 This was my first try with a cookie press and this recipe worked wonderfully, even though the directions that came with the press said to use only their recipe.